Defining Trait: Large eyes/Long rostrum. My Story: Since the day she was born on November 12, 2013, Windley has had an adventurous and friendly spirit. 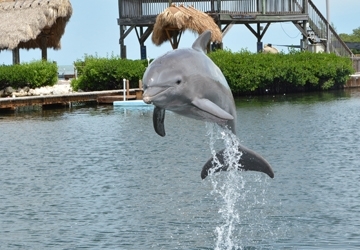 She is often seen playing either with her best friend and cousin, Diva, or on her own using toys in her lagoon. As the youngest daughter of Merina, it’s no surprise that Windley is drop dead gorgeous. 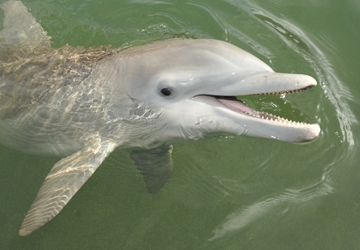 (Her father, a SeaWorld Orlando dolphin named Fathom is good looking, too!) She has already learned how to use that to her advantage! 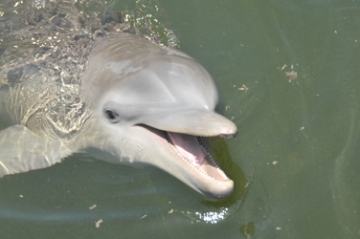 Guests walking on the causeway or boardwalks melt every time she swims up to bat her eyes at them or solicits attention by spitting water or giving a dainty wave. It seems she knows what the camera is too. She pops right up at the proper times to have her photo taken. Just like her big sisters, Pandora, Calusa, and Cayo, and her older brother Flagler, Windley enjoys fun games and loving from her trainers. She’s a big fan of back rubs, kisses, tongue tickles, and high fives.